Online presence, digital innovations and integration of Information Communication Technology (ICT), have become the hallmark of global competitiveness for organisations and policy-makers alike. Kenya is making great steps towards achieving targets set out in the Sustainable Development Goals (SDGs), and Education for All goals, through multiple innovations, and most notably ICT integration in education. The national ICT in education policy’s core values of: building a technological and innovative society; global competitiveness; research, innovation and development; and the attainment of 21st century learning skills for every student, have given impetus to ICT integration. It is within this policy context that iMlango is striving to promote e-learning in Kenya. Board of Management (BoM) members of a primary school receiving ICT equipment from iMlango in a primary school in Kilifi. iMlango is a groundbreaking program that seeks to improve education outcomes in numeracy, literacy and life skills for nearly 180,000 children in 245 schools - delivering access to digital education services and content. The program equips schools with ICT equipment and digital technology to deliver improved learning outcomes for pupils. iMlango seeks to positively impact on learning outcomes through creating positive synergies between students, schools and communities, helping to facilitate a positive local learning ecosystem. iMlango seeks to revolutionise literacy teaching and learning to dramatically improve literacy outcomes for pupils, working at four distinct levels: the system, the school, the community and policy levels. As most existing project activities are school-based, the literacy strategy will build primarily on these existing processes and initiatives. Promoting a reading culture in school, whilst developing a community that appreciates the power of reading. An iMlango literacy computer lab lesson in progress. Students have access to digital content for both individual lab sessions and teacher-guided whole-class lessons. At the school level, iMlango recognises the school as the focal point for the promotion of the reading culture and the advancement of reading competencies for our pupils. iMlango is therefore working with teachers on effectively implementing modern trends in primary reading pedagogy. At the core of the project is the use of e-resources to deliver quality lessons, so training and constant follow-up with teachers on the use of digital content and technology to teach reading is a key project activity. The communities are being sensitised on the role of ICT and digital technology in promoting access to inclusive, quality education - especially for girls and other marginalised pupils. Promotion of reading requires the involvement of the community. iMlango is working closely with community stakeholders to advocate for appropriate supplementary reading materials, to help organise reading exhibitions, to encourage parents and schools to sign the home-reading tracker, and to involve the Boards of Management (BoM) and Parents Associations (PA) in generally promoting the importance of literacy. Local education officials, head teachers and teachers are being trained to improve teacher preparedness, and reading lesson preparation via use of ICT and digital content as delivered by iMlango. In line with creating a supportive educational ecosystem, it is important that there is strong cooperation and coordination with the end goal of improving learning outcomes for pupils. We are currently in the process of establishing an MoE/TSC sustainable teacher support program to allow for greater synergies with local government officials, as well as setting up teacher peer-support groups at the school level. Head teachers have been supported to fulfil their role of first-line teacher support, and periodic forums with head teachers are planned so as to keep developing their capacities, whilst building formal feedback into project implementation. 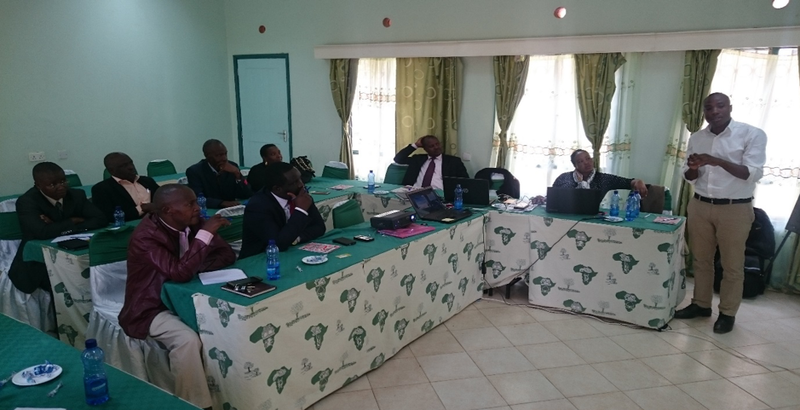 MoE and TSC officials training in Wote, Makueni. The MoE and TSC are integral partners in the implementation and oversight of iMlango programme. Whilst successes in each area of the literacy strategy are naturally important, we believe that all 4 levels (school, system, community and policy) require development if long-term, systematic improvements to pupils’ literacy skills are to be achieved.